March 31, 2013  Bassem Youssef lampoons Egypt's public figures on TV. He's accused of insulting Islam and President Mohammed Morsi, and his interrogation is prompting fears for free speech in the transitioning country. 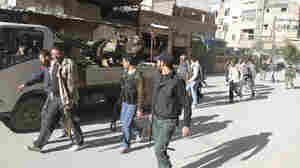 March 31, 2013  In Syria this week, rebels fighting to bring down President Bashar Assad have taken a key town in the country's south. 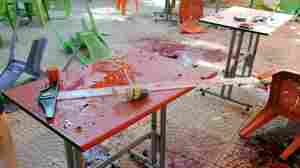 And in Syria's capital, Damascus, a mortar attack killed at least 10 students when an outdoor cafe was attacked. Host Rachel Martin talks with NPR's Kelly McEvers about the continuing conflict. March 29, 2013  Guest host Celeste Headlee speaks with Al-Jazeera's Abderrahim Foukara and NPR's Deb Amos about the worsening refugee crisis in countries bordering Syria. Rioting at refugee camps and rumors of deportations are putting the spotlight on Jordan and Turkey's ability to manage the refugee influx. 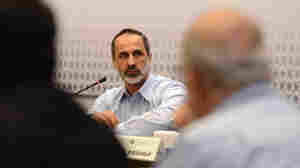 March 28, 2013  Mouaz al-Khatib said last Sunday he was reigning the presidency of the Syrian National Coalition. He criticized the international community for not doing enough to end the civil war in Syria. March 27, 2013  Robert Siegel talks to professor Joshua Landis about the leadership and future of the shaky Syrian opposition coalition. March 27, 2013  Russian President Vladimir Putin has consistently supported President Bashar Assad through Syria's violent crisis. Fiona Hill, senior fellow at the Brookings Institution, argues that Putin's support is linked to Russia's own history. March 26, 2013  More than 100 private aid groups have emerged since the uprising began, and many activists say the experience they've gained will be valuable in rebuilding the country. 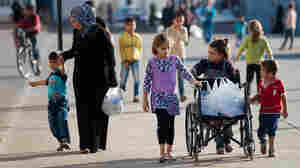 March 25, 2013  There are now more than one million Syrians seeking refuge in camps and towns in neighboring Lebanon, Jordan and Turkey. Many arrive without access to basic amenities, such as adequate shelter and clean water. Over two years of conflict has also left them with the mental scars of war. March 25, 2013  President Obama's visit to the Middle East has both inspired cheers and raised eyebrows among policy experts. But will his visit help reshape the debate over the region's future? Host Michel Martin discusses the trip with Peter Beinart, who edits The Daily Beast's Open Zion blog, and Saeed Khan, a lecturer and Middle East expert at Wayne State University. March 24, 2013  Secretary of State John Kerry touched down in Baghdad Sunday on an unannounced trip 10 years after the U.S.-led invasion toppled Saddam Hussein. 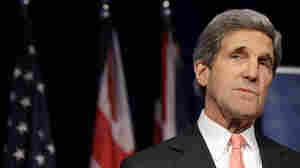 On his agenda is urging Iraqi leaders to stop overflights of arms and supplies from Iran to Syria. Host Rachel Martin speaks with NPR's Michele Kelemen, who is traveling with Kerry.